Our last stop for the day was Georgian Wines & Spirits, GWS. 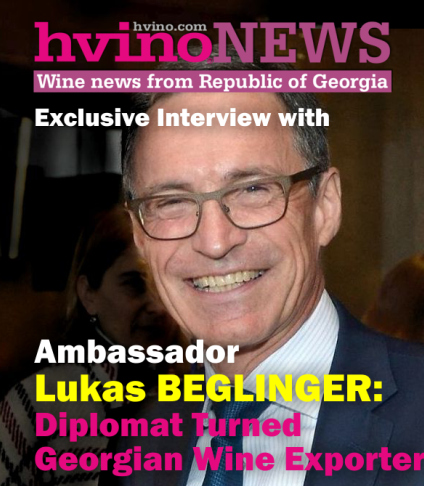 The company started in 1993, however; the winery was built in 1974 for the Soviet Union. Today the quality of the wines has improved and wines are exported to several countries. A separate brick building is the location of numerous qvevris that are currently unused. Plans are being made to eventually begin using the qvevri again. The building also has several clay artifacts of which five are 2,000 years old. Tomorrow morning we will be on our way to harvesting grapes at another Georgian winery. Our 6th day in Georgia, the cradle of wine, was amazing. The sun was warm and a slight breeze was delightful as we harvested two of Georgia’s indigenous grapes,the first was Rkatsiteli. As we harvested we sorted the grapes, leaving behind the few grapes that would not add to the flavor of the wines. We returned to Twins Wine Cellar in Napareuli where a smaller vineyard with Saperavi was ready to be harvested and we spent a little time harvesting these grapes. Twins Wine Cellar in Napareuli has 100 or so qvevris, handmade clay pots inserted in the ground where wines are fermented and aged. Special techniques are used when making these wines including cleaning with cherry bark and burning sulfur inside the qvevri. We helped to crush Rkatsiteli grapes and before long we added the crushed grapes to the 75-liter qvevri and covered the top. It was a long day but very enjoyable. 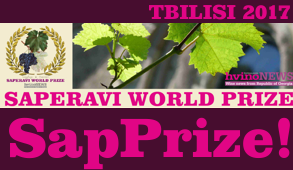 Twins Wine Cellar in Napareuli offers a terrific agritourism experience for visitors. In addition to the wine, Twins Wine Cellar offers experiences in the vineyard and winery during the year. Visitors can lodge at the winery hotel in Napareuli and enjoy a meal at the winery. Be sure to check out the winery website. Before arriving back at Chateau Mere for the evening we stopped at Lopota Lake, a resort for a sumptuous dinner. Views of the manmade lake with the Caucasus Mountains in the background were eye-catching. Dinner included sausage wrapped in crepes, chicken, tomato salad, fresh baked bread and much more. Our day began with a visit to the 6th century Ikalto Monastery that included an academy. It was also known for being a large winemaking enterprise with numerous qvevri discovered. Our visit included a description of how St. Nino brought Christianity to Georgia. Soon we left the monastery for our first visit with Remi Kbilashvili a qvevri maker. He is a fourth generation qvevri maker and his son will continue the tradition. Currently he is working on eight large qvevris that was a special order. 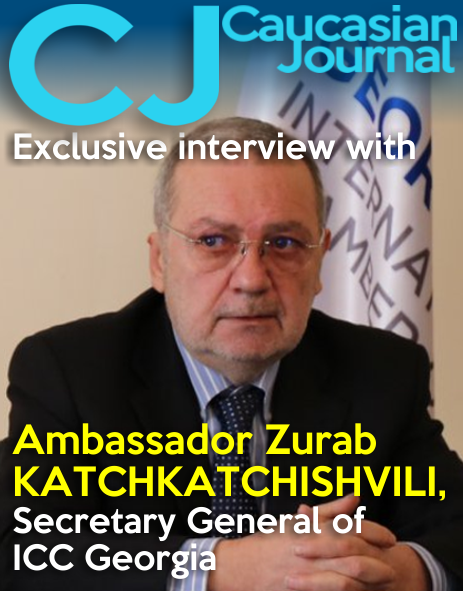 He noted that only three people are making qvevri in Georgia today. Our next visit was at a small winery that produces 2,600 bottles of qvevri wine. Winemaker Kakha Berishvili is friendly and laid-back. His winery is located close to the Didkhevi River. The vineyards are across the river about one kilometer away. After lunch at Marleta Café, we visited Besini. This winery began as a plant nursery. They followed with a vineyard and then began producing wine. Currently they are producing 500,000 bottles and with the Russian embargo lifted, they will be producing 3 million bottles. While producing wine they are also completing the winery. Next they will be renovating old buildings to be used for a hotel and building a tasting room. Besini has a bright future ahead as an agritourism site. Pheasant’s Tears is a winery with a restaurant in the renovated mountaintop town of Sighnaghi. The name Pheasant’s Tears comes from the local area where it has been said, “You can make wine so good you can make a pheasant cry.” Pheasant’s Tears owner is an American who discovered Georgian hospitality and decided to start a winery here. He has several vineyards, one of which is a vineyard library with 200 different grape varieties. His most unusual but very good wine has 80 different varieties in it. Tuesday was a very busy day with visits to three Georgian wineries. 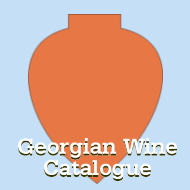 Two of the wineries are small production wineries that are producing wines using the Georgian traditional qvevri. The other winery produces large quantities of wine using stainless steel tanks and oak barrels. 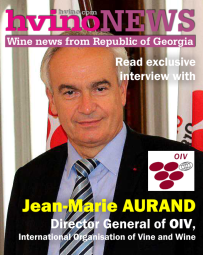 In 2011 they began producing qvevri wines. Our first visit of the day was with Nika at his home winery. We discovered that Nika is an artist, sculptor and winemaker. He concentrates his winemaking skills on producing qvevri wines. Nika was born in Tbilisi and lived in Germany for several years. He returned to Georgia and now resides in a small village. Our next visit was to Teliani Valley a large production winery. We began our visit at the press pad where grapes were dumped into the crusher. We also visited the winery with numerous large stainless steel tanks and oak barrels. Following this we went to another area where several qvevri have been buried. A short time later we were escorted into the large tasting room that had a delightful wine setting. Our last winery for the day was Our Wine, a small producer of qvevri wines with his own vineyards. We sat at a picnic table in the shade of trees to talk about and taste wine. We look forward to learning more about qvevri wines. On day 9 we visited Shavnabada Monastery of Saint George Wine Cellar a short distance outside of Tbilisi. The monastery is located on Mount Shavnabada. It is here that monks produce Shavnabada wine using the age-old technology of qvevris. An article about our experience at the monastery is available online. We had a free afternoon and decided to walk from our hotel to the Vino Underground. This is a small shop that offers natural wine and small plates of food. Natural wine refers to wine that has had nothing added to it including yeast. Our experience indicates that natural wines have a fresher fruit aroma and taste. It should be noted that winemakers who produce natural wines do not want the term organic used. Organic winemaking allows the use of some products other than grapes. On the 10th day of our visit to Georgia, also known by the people of Georgia as Sakartvelo, we left Tbilisi and traveled to western Georgia heading towards the Imereti region. The main road was well maintained and smooth. After passing through a long tunnel in the mountains we continued on until we stopped at a qvevri maker. Zaliko Bodjadze explained what he does, answered our questions about qvevri and proceeded to show us how he adds coils to the qvevri to increase its height. After adding about three inches of clay, he takes a smooth thin piece of wood to smooth the clay coils. In three days he will add another layer. Nearby is a special building built for firing the qvevri. When applying the thin limestone covering he demonstrated how he adds wire designed to protect the clay qvevri. Soon we left for a visit to Archil Guniava Wine Cellar, a family winery that produces only qvevri wines. We were greeted and welcomed by the entire winemaker’s family including Archil’s wife, children and parents. He uses a wood press for making his wines. His qvevri are housed in the marani (cellar.) He also has vineyards that include some of Georgia’s more unusual grape varieties. He expects that his family will continue the winemaking tradition. Our last stop before going to our hotel was Gaioz Sopromadze’s Wine Cellar. The winemaker, Gaioz, took us to see his offsite vineyards where he has some of Georgia’s special grape varietals. Next we went to the marani (wine cellar) next to his home where he has several qvevris buried in the ground. We went to his wine cellar and tasted several wines made from grape varieties we had yet to taste. Terry’s favorite wine was an experimental wine because it was fruity and had bold tannins. 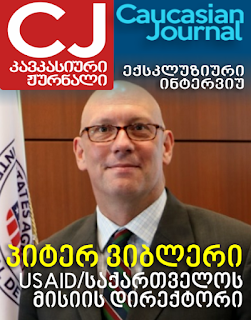 We are looking forward to another day in western Georgia, Sakartvelo!